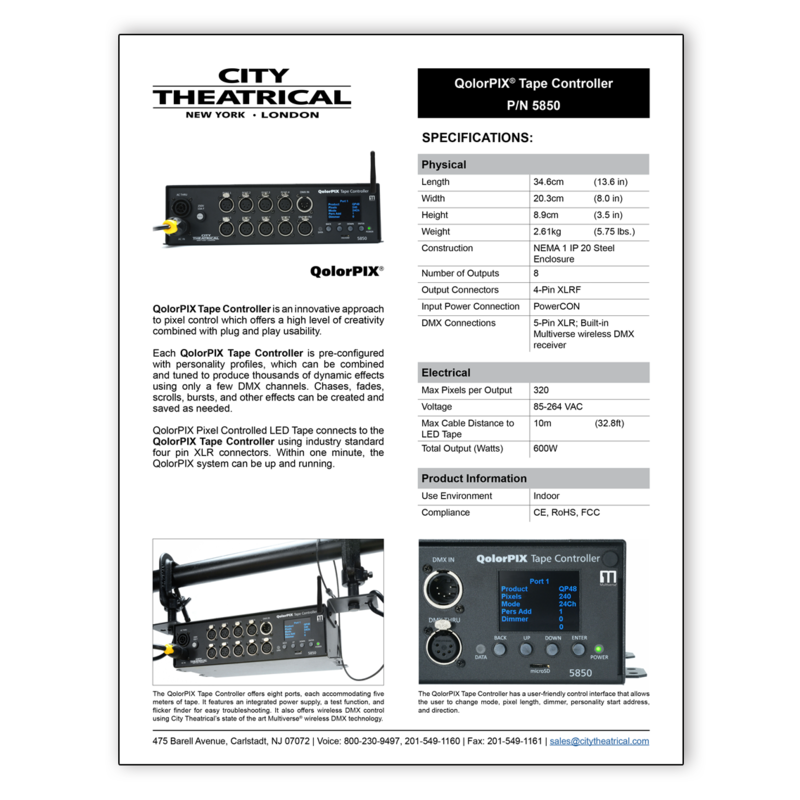 City Theatrical’s new QolorPIX Pixel Tape Controller is preconfigured with personality profiles that can be combined and adjusted to produce thousands of dynamic effects with QolorPIX Pixel Controlled LED Tape using only a few DMX channels. Any lighting effect you can imagine - chases, fades, scrolls, bursts, and more - can be created in minutes. 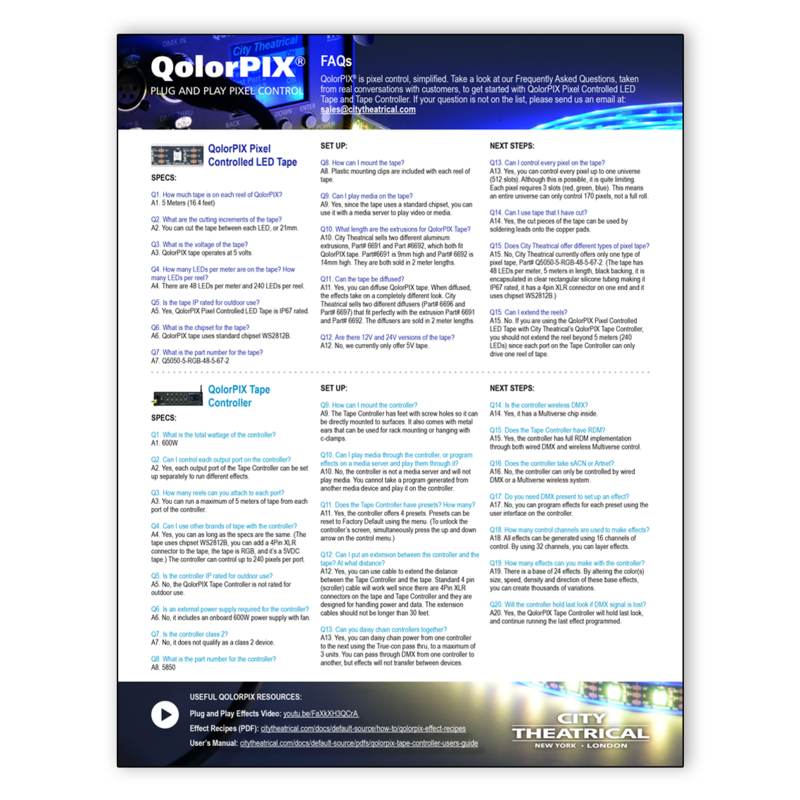 The QolorPIX Tape Controller offers eight ports, which accommodate a total of 40 meters of QolorPIX Pixel Controlled LED Tape. A user friendly control interface allows you to change mode, pixel length, dimmer, personality start address, strip type, fixture ID, and direction. The controller features an integrated power supply, a test function and flicker finder for easy troubleshooting. It also offers wireless DMX control using state of the art Multiverse® technology. Q1. What is the total wattage of the QolorPIX Tape Controller? Q2. Can I control each output port on the QolorPIX Tape Controller? A2. Yes, each output port of the Tape Controller can be set up separately to run different effects. Q3. How many reels can you attach to each port? A3. You can run a maximum of 5 meters of tape from each port of the controller. Q4. Can I use other brands of tape with the QolorPIX Tape Controller? A4. Yes, you can as long as the specs are the same. (The tape uses chipset WS2812B, you can add a 4Pin XLR connector to the tape, the tape is RGB, and it’s a 5VDC tape.) The controller can control up to 240 pixels per port. Q5. Is the QolorPIX Tape Controller IP rated for outdoor use? A5. No, the QolorPIX Tape Controller is not rated for outdoor use. Q6. Is an external power supply required for the QolorPIX Tape Controller? A6. No, it includes an onboard 600W power supply with fan. Q7. Is the QolorPIX Tape Controller class 2? A7. No, it does not qualify as a class 2 device. Q8. What is the part number for the QolorPIX Tape Controller? Q9. How can I mount the QolorPIX Tape Controller? A9. The Tape Controller has feet with screw holes so it can be directly mounted to surfaces. It also comes with metal ears that can be used for rack mounting or hanging with c-clamps. Q10. Can I play media through the QolorPIX Tape Controller, or program effects on a media server and play them through it? A10. No, the controller is not a media server and will not play media. You cannot take a program generated from another media device and play it on the controller. Q11. Does the QolorPIX Tape Controller have presets? How many? Q12. Can I put an extension between the QolorPIX Tape Controller and QolorPIX Pixel Controlled LED Tape? At what distance? A12. Yes, you can use cable to extend the distance between the Tape Controller and the tape. Standard 4 pin (scroller) cable will work well since there are 4Pin XLR connectors on the tape and Tape Controller and they are designed for handling power and data. The extension cables should not be longer than 30 feet. Q13. Can you daisy chain QolorPIX Tape Controllers together? A13. Yes, you can daisy chain power from one controller to the next using the True-con pass thru, to a maximum of 3 units. You can pass through DMX from one controller to another, but effects will not transfer between devices. Q14. 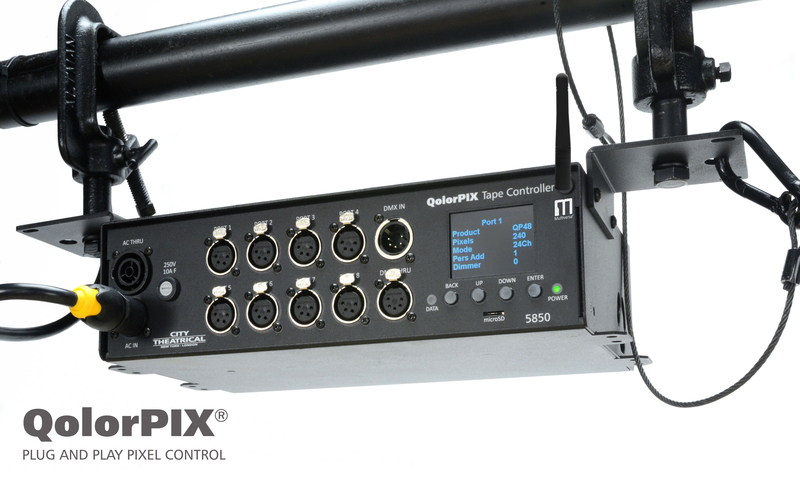 Is the QolorPIX Tape Controller wireless DMX? A14. Yes, it has a Multiverse chip inside. Q15. Does the QolorPIX Tape Controller have RDM? A15. Yes, the controller has full RDM implementation through both wired DMX and wireless Multiverse control. Q16. Does the QolorPIX Tape Controller take sACN or Artnet? A16. No, the controller can only be controlled by wired DMX or a Multiverse wireless system. Q17. Do you need DMX present to set up an effect? A17. No, you can program effects for each preset using the user interface on the controller. Q18. How many control channels are used to make effects? A18. All effects can be generated using 16 channels of control. By using 32 channels, you can layer effects. Q19. How many effects can you make with the QolorPIX Tape Controller? A19. There is a base of 24 effects. By altering the color(s) size, speed, density and direction of these base effects, you can create thousands of variations. Q20. 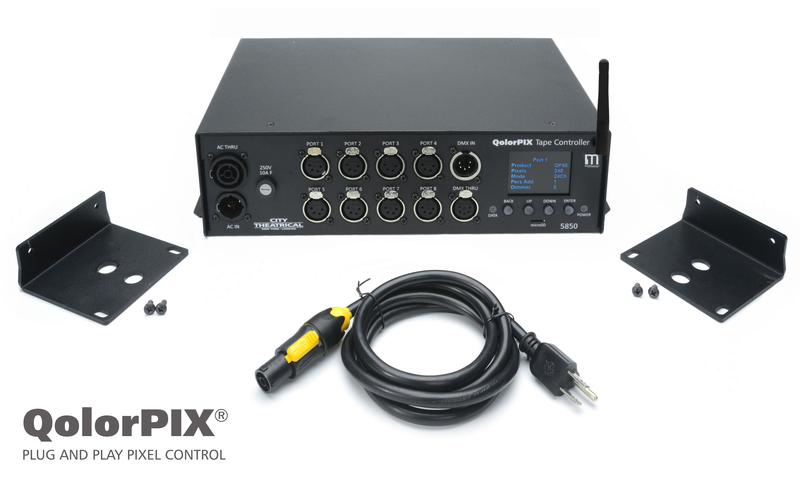 Will the QolorPIX Tape Controller hold last look if DMX signal is lost? A20. Yes, the QolorPIX Tape Controller will hold last look, and continue running the last effect programmed.